Muc-Off’s Bio Dry Lube contains a wax- based formula for optimal performance in dry and dusty conditions. It also contains exceptional penetrative qualities that help the lube reach every nook-and-cranny of the intended component thereby providing overall protection, smooth riding and quiet shifting. As its name implies, this lube is biodegradable so it’s a safe substance all-around. For easy and precise application, the Bio Dry Lube has a built-in pipette within the nozzle. Muc-Off recommends using this particular lube on chains, cables, shifters and derailleurs. I have several C3 Ceramic lubes, plus the regular dry lube in my possesion. I use these on all my bikes. The chain stays cleaner along with the cassette gears. So glad I found this stuff. I have a full bottle of Rock & Roll, but I do not think it as good as this product. I am happy to find it available at several places, as it sometimes can be hard to find where it can be shipped to USA. I have been using dry lubes for many years. I am certainly in the minority of riders and wrenches I know who likes Pedro's Ice wax (the original formula was is superior to the latest generation). Wax based lubes work well in dry conditions, particularly when one services their bike regularly as one should. I've used Muc-Off's Hydro dynamic lube and liked it's overall performance so I gave Bio Dry Lube a try. My immediate first impression was the smoothness and how quiet the drive train was. 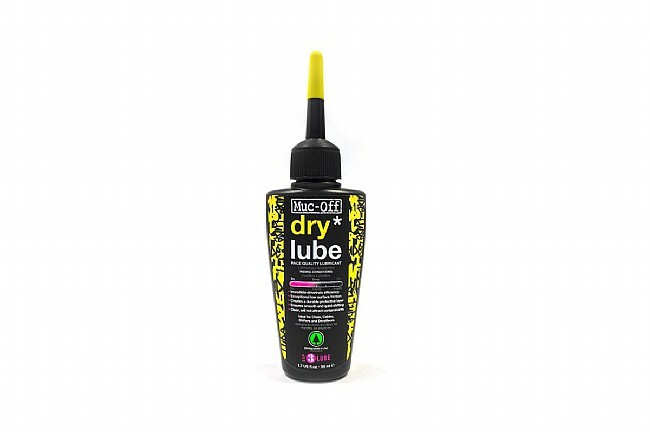 I would recommend this lube to anyone who rides in dry conditions which of course we all prefer to unless of course it's cross season. Works great in the summer time in South Texas. Haven't run it in the rain yet, so don't have a review for wet conditions.